Some fascinating objects have been found during the refurbishment of St George’s Hall in Bradford. 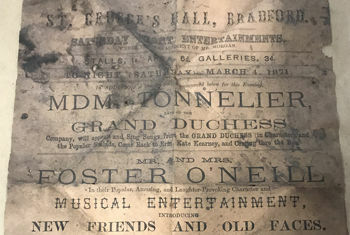 Workers carrying out the £8.5 million refurbishment of the Grade II listed building have found several interesting objects tucked away, including a handbill from 1871 promoting a programme of Saturday Night Entertainment, which was printed by J Clegg Printer by Steam Power, Infirmary Street, Bradford. The programme for the evening included Madam Tonnelier performing songs in character from the Grand Duchess, as well as a line-up of music and sketches including Irish and Scottish songs and stories by Mr and Mrs Forster O’Neill accompanied on the piano by their daughter Flora. An account of the same performance by the Forster family can be found in the newspaper The Waterford News, from Friday 5 June 1868, when they appeared at the Assembly Rooms, City Hall. Workers have also found the front page of the Daily Express newspaper from 10 January 1928. The front page contains an article about plans to build a barrage in the wake of the Great Flood of London, which had taken place only a few days earlier, on 7 January 1928. The flood claimed 14 lives and left thousands of Londoners homeless. Other items found when the old seats were removed from the Dress Circle, include a wrapper from a Cadbury’s Flake when they only cost 6d, an old Galaxy Milk Chocolate wrapper and several cigarette packets, including a Black Cat Cigarettes tin lid possibly from the 1930’s, a Wild Woodbine cigarette packet, an Ogden’s Robin cigarette packet and Craven A cigarette packet. There were also two concert tickets one for a Bradford Subscription Concert and one for the 31st Annual Speech Night for The Priestman School held at the venue on Wednesday 14 March 1956, with Ernest Cummins giving a speech and Mrs Cummins presenting the prizes. The items found will form part of the permanent archive display held by Bradford Theatres. St George’s Hall which is located in Bradford city centre is currently undergoing major refurbishment which has been made possible by funding from Bradford Council and the Heritage Lottery Fund. The refurbishment of St George’s Hall, one of the oldest remaining concert halls in the UK, will ensure that this heritage building is maintained and brought up to standard as a top class venue adding to the fantastic cultural offer in Bradford. “These are fascinating finds that give us a glimpse into the history of this wonderful venue and the types of entertainment that was popular at the time. It’s amazing to think that the theatre was only 18 years old when the handbill was dropped between the seats in the rear gallery. Click here to see the gallery of images.